This is a book that deals honestly with the sharp edges of guilt, remorse, and aftershock common to survivors of traumatic events. 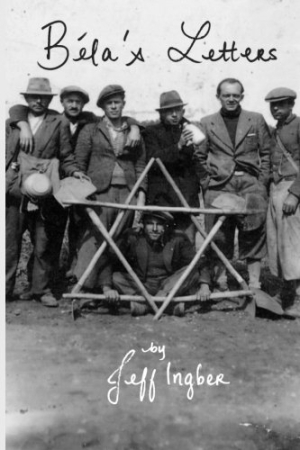 The vast tragedy of the Holocaust is brought to heartbreaking life in Jeff Ingber’s reality-inspired Béla’s Letters, a novel told through the letters and remembrances of individual members of a large family of Hungarian Jews. The story begins in 1928, in the Hungarian town of Munkács in the Carpathian Mountains. Despite the prevalence of anti-Semitism, half the city’s population was Jewish, a diverse mix of Zionists, Hasidim, Orthodox Jews, and Jews whose religion was more a matter of culture than faith. Béla Ingber, the book’s narrator and connecting point for other characters, is a member of the youngest generation of one of the town’s long-established Jewish families. The fates of family members are followed through his eyes into World War II and decades of postwar peace. Because the narrative begins before Hitler’s rise, characters have time to reveal themselves as individuals, rather than as victims or survivors. Knowing them as ordinary people pursuing careers and living in a close-knit family makes the tragedy to come all the more jolting. When Nazis conscript Béla and other Jews for forced labor, his account of life in a labor camp is detailed and harrowing. Ironically, conscription is also his salvation—as a useful laborer, he is not sent to a concentration camp. Other members of his family are not so lucky. The family is broken up, its members seldom able to stay together, and their letters, written with the thin hope of keeping bonds alive, become a kind of heroic testament to the human spirit. World War II and the Holocaust are arguably the biggest story of the twentieth century. One of the book’s achievements is that it avoids two common errors: letting history overshadow the story, and using characters as mere tour guides to tragedy. Throughout the narrative, the focus remains tight, the characters real and immediate. Rather than a happily-ever-after final section, the book deals honestly with the sharp edges of guilt, remorse, and aftershock common to survivors of traumatic events. While some might quail at the book’s almost 600-page length, the pace is swift thanks to the epistolary style and competent writing. A photograph of family members who figure in the book enhances the impact of the story, and a family tree is extremely helpful in keeping track of the aunts, uncles, and cousins in this large clan. This is a well-written and moving book, but also one packed with information about what it was like to live through the worst days of the twentieth century. World War II buffs, students of Jewish history and culture, and readers looking for a moving tale of disaster and survival will find Béla’s Letters a worthwhile and memorable read.